Q. How has it been to meet all the people in Madrid? RAFAEL NADAL: Well, great, as I always said. I've said it many times that people here are ‑‑ I think it's really special. Especially with me. I think that in other places of the world, none other place of the world I receive the support I receive here. I just want to say thank you. It's always very nice to be here. I feel very excited when I play in this city. Q. How do you feel? How is your tennis? 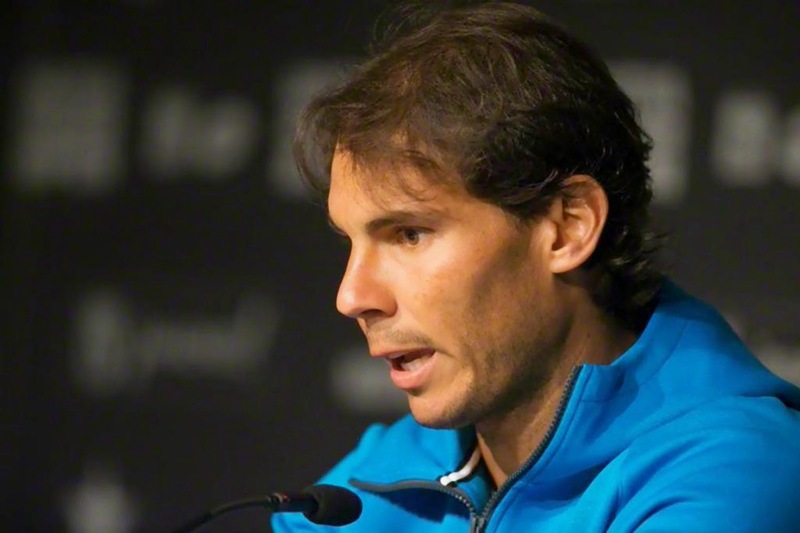 RAFAEL NADAL: Well, I went out there to do a simple game with no complications. I tried to play easily. I didn't try to look for complicated things. I know how things work out when you come from losing a couple of matches. I know that you're a little bit nervous whenever you finish a game as I finished the other day with Fognini in Barcelona. I tried to start from the bottom and just go up. I think especially the last three games I finished pretty well. I managed to do a couple more things with my backhand, and I changed to parallel. I tried to make danger with the intermediate ball. I think that in a couple of moments I just needed to throw that ball. Just try to make more danger with my shots. I try to put balls where they cannot attack me, or when he tries to attack me, it's very risky for him. I think last week I lacked that. Monte‑Carlo I did well, but last week my ball was not making danger to the opponent. I think that's something vital. Q. Last year there was also a couple of losses against Almagro. You don't have the obligation to win ten Monte‑Carlos or whatever. Are you having fun? RAFAEL NADAL: Well, talking about I don't have to win, you know, the only thing I can do is just say thank you to life and everything and all the people that help me to manage everything that I have and where I am today. I just have to say thank you. You always have up and downs. A lot of players have them. I already had them in the past. Last year I had them, but perhaps in a different way to this, because I started quite well. Also we know what happened. This year I started the year and it's not been very regular. Maybe more irregular than what I wanted. I accept it. I just face it. I try to work day after day to go back to the regularity. I try to build my confidence. After that, let's see how things happen. If they don't go the right way to face it and try to make it better ‑‑ I'm convinced they're going to work out. I don't know if it's this tournament or the next one or in five, six months or a years' time, but I don't have any reason to think that things are not going to work out. I'm happy. I have the allusion, and I know things are going to work out. I haven't lost my game. I just need to build my confidence and it'll work out. I know that either sooner or later it will come back. That's what I want to think. I'm convinced about it. After that, it's matter of time. Let's see when it happens. Q. You've had an easy match; you served very well. Also, you were very happy when you scored many of the points. Does that mean you were nervous or just wanted to do well here in front of your people? RAFAEL NADAL: No, not one thing or the other, just a matter of attitude. Just tried to be as positive as I can knowing that small things make a difference. So not only judging big things, but also the small moments, you know. Just try to celebrate them, celebrate the small changes that I make. Every single moment is important, and especially during these times I just want to celebrate them. I celebrate them because I need to celebrate those things. I need to feel that. I'm sure that the audience also does that, they feel it. The only thing I can do is just get the people to celebrate the points the same as I do. Q. Today you did the fastest ATP match. Do you think in this tournament you're going to finish your matches fast? 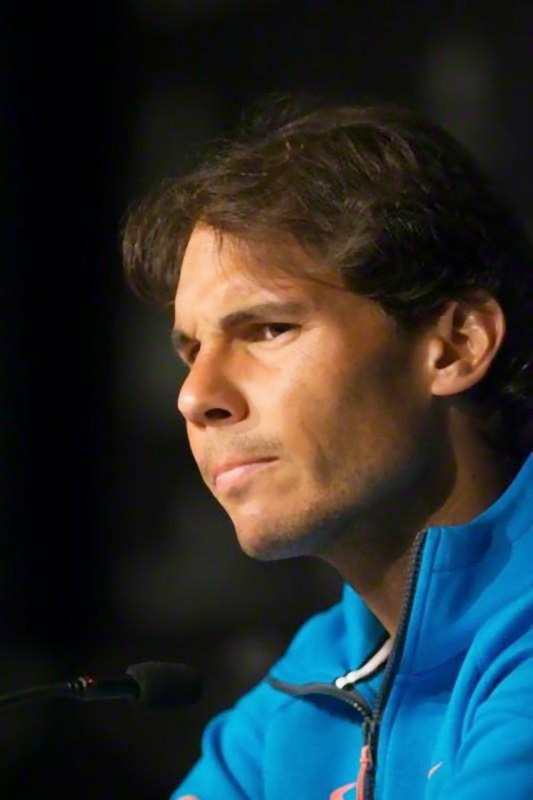 RAFAEL NADAL: No, no, no, sincerely I don't understand your question. I try to do as good as I can. That's my goal in every point and in every match. But I don't want to just finish the matches quickly. I want to do as good as I can. The important thing is they don't finish the matches against you fast rather than you finish the matches against them. Q. We are talking about Juan Margets, that he wants to go the to presidency for ITF. He has a proposal for Davis Cup. He wants to play the matches to five sets. What's your opinion about that? RAFAEL NADAL: Well, I don't know. It's complicated. I think that we don't have to go that way from my point of view. That's not the changes that have to be made. I think that he knows well. But there are problems that he just doesn't want to know about. Maybe he doesn't see. He's been a lot of years in the ITF and could have helped with a lot of measures back in the day. I think they're still important. After that, just the best for him, for his candidacy. Of course it would be great to see a Spanish person as president. From his actual position he could have done more, I think. Q. How have you seen Nishikori in Barcelona? RAFAEL NADAL: It's been a really good for him. Q. Were you surprised about anything in particular of his game? Second question is, if we suppose both of you are going to make it to the final, are you thinking of that? RAFAEL NADAL: Well, the only thing I need right now is to go and see football in an hour, hour and a half. I'm not thinking of anything else. After that I'll just rest and try to get good training tomorrow morning and get ready for tomorrow's match. Kei is a really good player, and he's been demonstrating that week after week. He won the Barcelona tournament, a really good tournament. Nishikori is just one of the best players in the world. Of course he has options to win in every tournament he plays in. I cannot think of Nishikori when I'm just in the second round. A Master 1000 final, I still haven't played one this year. Q. I wanted to ask you how did you see yesterday the match of Real Madrid? Are you going to be able to see them here? What's your feeling about that? RAFAEL NADAL: Well, the match was complicated as always. When you play out of home Champions League it's always difficult. I think Real Madrid had not a good score, nor a bad either. So everything is open for when then come back here to Madrid. Bernabeu is going to be there supporting him, and I hope things are going to work out. Q. Are you going to go? RAFAEL NADAL: Where, to Bernabeu? I'm in Rome. Q. Could you just talk me through the match today and your assessment of how you feel you played? RAFAEL NADAL: Well, good afternoon. I think I played a solid match. I played enough consistent to be through. I played the way I needed to to win that match. I know after a loss like Barcelona things are not easy when you're playing the next match. So I tried to play the easiest way possible without trying very difficult shots, and trying to be better and better during the match. I think I did. I think I need to play a little bit better tomorrow if I want to keep having chances to be through. I going to try to. Q. Sorry if the question has already been asked, now that you have switched back to your old racquet, it seems like you have found your rhythm. Tell us what made you go for a new racquet ahead of the clay court season? RAFAEL NADAL: No, no, no, my rhythm is not back. I won a match today. I won an important match that give me the possibility to play again tomorrow. I said when I was playing with the new racquet a few weeks ago, when you have mistakes, when you win, when you lose, it's not because of the racquet. Never. It's because of yourself. The other racquet is great. I need to adjust and practice a little bit more with that racquet. Was not enough practice before that two weeks. But I came back to that racquet because it's the racquet that today give me a little bit more confidence, a racquet that I know better than the other one. These tournaments are important for me. But I know that racquet is my future. Q. You've been at the highest level for an incredible amount of time. I was looking at some figures that surprised me. It's 11 years that you've been winning a major ATP clay court tournament before going to Roland Garros. Hopefully of course you aim for one victory here. How do you find after all this time your physical condition and how do you find your hunger for winning? RAFAEL NADAL: Well, the physical condition today is better than in a lot of other moments in my career. That's the real thing. And the hunger to keep winning is there. The motivation to keep playing tennis, to enjoy this great tour we have and to keep having chances to compete for the events that I need to compete is a big motivation for me. I am very excited to try to change that dynamic that I am not happy with. I know dynamics are tough to change, but I know if I am working well and if I am working with the right motivation, that's going to happen. I have the conviction that that can happen, and I have decided to do everything that I can do to come back to that regular consistent level that I had for a lot of years. It's obvious that I am not 20 anymore. I have almost 29. But I feel myself enough motivation to keep going for a couple more years. Q. How different has this year been for you? In the past you've had injuries, but things have clicked quite quickly when you started. Obviously you found success quite quickly. Now you've had to be patient and understand things will take their time. Is there this a different sensation for you? RAFAEL NADAL: It's all about moments, and all the moments are different. Different feelings, different situations on the career of everyone. You have to pass all these moments. I had injuries; I had much more good than bad moments. But I had some tough moments with injuries in the past, and now I'm not injured. That's a very important point. I am on the court. If I am on the court, I have the chance to play well and win matches. Last year for six months I didn't have that chance. If I am not winning matches today, I accept. If I am not playing well enough, only thing I can do is accept, stay positive, work as much as I can, and be positive knowing that the normal thing‑‑ if I had success during 11 years, why can't I have success again if I am motivated enough? I am fit; I don't have injuries; and I cannot forget to play tennis in six months.